“Students sent WMC Action News 5′s Michael Clark a photo of the teacher’s white board that lists ‘bless you’ and other expressions that are banned as part of class rules.” Here it is black on white. Thank God for camera phones and citizen journalists. “That all men have a natural and indefeasible right to worship Almighty God according to the dictates of their conscience. . .” (Art 1, Sec 2). “No person who denies the being of God, or a future state of rewards and punishments, shall hold any office in the civil department of this state” (Art 9, Sec. 2). 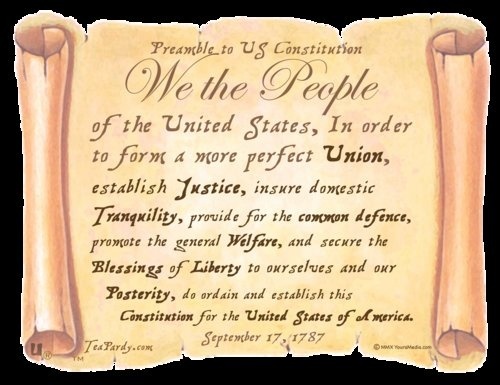 The phrase “in the year of our Lord” appears seven times in the Preamble. This government school teacher needs a history lesson since the constitution of the state of Tennessee uses “godly speaking.” To disavow one means to disavow the other. A civics class (Do they teach civics anymore?) should have made this clear. SECU’RE, a. [L. securus. ] 1. Free from danger of being taken by an enemy; that may resist assault or attack. Note what follows: “to ourselves and OUR POSTERITY.” Kendra and all students in America are included in “our posterity” and are to have the “secure blessings of liberty,” and that means the fundamental right to say “bless you” when someone sneezes. If the Constitution is OK with “godly speaking,” then so should Kendra’s teacher.